World Poetry Celebrates the Wonderful Erin McDougald! 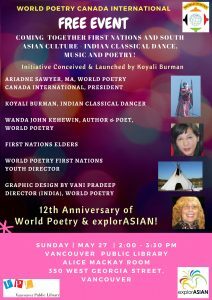 Posters from our upcoming event from the VPL and Vani Pradeep. Ariadne’s Notes: The World Poetry Cafe Radio Show, May 3 on CFRO, 100.5 FM 1-2 pm PST was honored to feature Selwyn Jacob from the National Film Board speaking about his retrospective film The Road Taken and publicist Katja De Bock who brought some tips for upcoming actors in the studio. 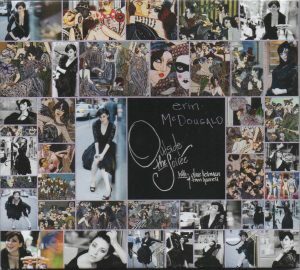 Also calling in at 1:30 PM PST, was the wonderful jazz musician from Chicago Erin McDougald celebrating her new CD “Outside the Soiree” and giving her thoughts about being an outsider and the MeToo movement. She kindly agreed to answer a question from a young aspiring musician from Arkansas who asked her about the role of women in music and how the Me Too movement has affected women in the music industry. The World Poetry Team does a great job keeping us on the air and interviewing fascinating guests. Due out March 16, 2018 (Erin’s birthday!) from Miles High Records, Outside the Soiree offers a thematic narrative explored through “McDougald’s evocative artistry” (Chicago Music Guide), a voice that Jazz Improv Magazine has called a “rare instrument to be savored… sweet and spicy, positively mercurial.” The subject matter is poignantly and uniquely expressed from unexpected musical angles as Erin seamlessly amalgamates, modernizes and reinterprets obscure standards, her own original composition and genres “outside” the jazz idiom within a progressive jazz mentality. She’s joined by a stellar band featuring guitarist and pianist Rob Block, bassist Cliff Schmitt, drummer Rodney Green, percussionists Mark Sherman and Chembo Corniel, and saxophonist Dan Block. The band is given the imprimatur of a couple of born outsiders who’ve become insiders (and legends) through decades of singular artistry: saxophonist David Liebman and trumpeter Tom Harrell. McDougald is well acquainted with the outsider’s existence; she tends to be one herself. Known by her fans as “the Flapper Girl,” the Chicago-based improvisational jazz singer is a progressive thinker with a throwback aesthetic. She embodies the sensuality and fierce emancipatory attitude of an audacious fashionista and political egalitarian in her personality and artistry. With a moniker evoking a ’20s-era flapper she’s not interested in glamorous nostalgia, but instead spotlights the formidable female icons that stemmed from an era of resistance that forever changed American culture and its musical heritage. As McDougald regularly points out to audiences, flappers were suffragists, with libidos, rhythm, style and social cachet. As “the flapper girl of modern vocal jazz”, Erin’s artistry has become synonymous with marrying vintage foundations and contemporary concepts in her rhythmic, daring interpretations of era- spanning jazz, from American Swing through the Post-Bop catalogue. Her ability to borrow music from other genres and infuse a jazz treatment has garnered her fans of all ages, and collaborators with global renown. With performances in sold-out venues from Chicago to Paris, McDougald has headlined The Chicago Jazz Festival’s Heritage Stage, and premier jazz venues such as The Jazz Showcase, The Allerton, Green Dolphin Street, The Green Mill, 54 Below, Smalls, Anthology, Savanna Jazz, The Mint, Dizzy’s of San Diego, The Velvet Note, BluJazz, The Acorn Theater, Notes Jazz Club, and Le Bilboquet in Paris, among many others. Outside the Soiree is a sublime symposium of venerable soloists and emerging talents that expose a raw synergy and emotive message. Erin’s keen idea to turn Charles Deforest’s obscure, melancholy 1950’s ballad “Don’t Wait Up for Me” into a liberating, rhythmic 5/4 proclamation also crystalizes the style and strengths of featured soloists David Liebman on soprano saxophone and Tom Harrell on trumpet (with impeccable embellishment by drummer Rodney Green). Likewise, the sophisticated and changing time signatures on Erin’s “Midnight Sun” shed light upon vibraphonist Mark Sherman’s musical eloquence where again Liebman shines in a flurry of pithy soprano sound. Brothers Rob and Dan Block create an ethereal, sorrowful beauty on the group’s Chorinho-styled adaptation of the Broadway musical song “Unusual Way;” Tomoko Block (Rob’s wife) teamed up with Rob to arrange this gem, showcasing Rob’s quietly weeping guitar solo and Dan’s haunting clarinet playing. Percussionist Wilson “Chembo” Corniel is strongly showcased along with bassist Cliff Schmitt on Erin’s original composition and title track “Outside the Soiree” in a connected, reflexive and moving journey through Erin’s poetic lyricism and mournful melody. Hard-swinging is Erin with her band on songs like “Spring Can Really Hang You Up the Most” and “Don’t Be on the Outside;” exceptional elements of avant-garde singing and playing are showcased on the CD’s final cut, “The Parting Glass,” a deftly reimagined traditional Irish funeral hymn in a minor key, performed with thundering gravity. The addictively nuanced Cha-Cha rendition of “Brother, Can You Spare a Dime?” gloriously highlights the band with undulating musicality and fervor. 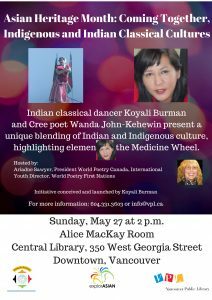 This entry was posted in Ariadne's Notes, E-Poets, Featured Poets, General and tagged Braitwaite and Katz, Erin McDougald, International Peace Award Ariadne Sawyer, Katherine Growdon, Victor Schwartzman on May 12, 2018 by Ariadne.